With its edgy styling and sportier-than-average driving demeanor, the 2012 Nissan Armada stands out from the SUV crowd. Based on the Titan pickup, the Armada offers seating for up to eight, plus rear-drive and 4-wheel-drive configurations. While its 317-horsepower flex-fuel V8 gives the Armada an impressive 9,000-pound maximum towing capacity, those ponies do have a rather prodigious thirst for fuel. Best SUV for camping, fishing and sport outings. I love the space inside. We do a lot of fishing and camping and it is perfect, lots of room. I am a short person so the gas pedal moving forward helps a lot so I do not have to adjust my seat too forward and be too close to the airbag. I love the backing up camera, helps a lot since the truck is big and hard to back up in tight places. I like that it also has the ac and radio controls in the back. Also like that it is 4 wheel drive, makes it a lot easier to pull out camper trail in rough roads. I do not like the way the radio controls are, the tuning is to the right side and hard to reach. Why I love my Armada and it is the best vehicle for a family. It is truly the best vehicle I have ever owned. It is super reliable, roomy, and great for a family vehicle. I have never had a bad experiences with this car. I would suggest this car to anyone who is looking for a car with solid performance. The Armada that I have comes with leather seats, which are easy to clean with a family vehicle. We have taken this vehicle for many long trips. The Armada has plenty of room to pack all you need for a long trip and to have still enough room to comfortably travel without being cramped. It is a very well made vehicle the interior has held up great. My armada is a great family vehicle. My armada, thorn, is a very reliable vehicle that easily accommodates 8 passengers. I purchased my vehicle to accommodate my growing family. My three girls enjoy riding in the comfy seats. I like that the last seat folds down to haul bulkier items. 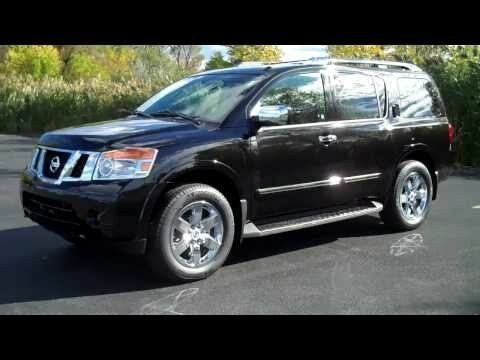 The Nissan armada is a great vehicle to use when going on family trips or short runs for ice cream. It has decent gas mileage in my opinion. I plan on keeping my truck until it can no longer run. I think that it is roomy and spacious enough for any family. This vehicle works for children all the way from infancy to adulthood. NISSAN IS RECALLING CERTAIN MODEL YEAR 2012 TITAN AND ARMADA VEHICLES, MANUFACTURED FROM AUGUST 12, 2011, THROUGH MARCH 13, 2012. THE PART 567 CERTIFICATION LABELS ON THE VEHICLES DO NOT CONTAIN RIM SIZE INFORMATION. THUS, THESE VEHICLES FAIL TO COMPLY WITH THE REQUIREMENTS OF FEDERAL MOTOR VEHICLE SAFETY STANDARD NO. 110, ?TIRE SELECTION AND RIMS.? THE OMISSION OF THE RIM SIZE MAY LEAD TO AN INCORRECT TIRE/WHEEL COMBINATION WHICH MAY INCREASE THE LIKELIHOOD OF A CRASH. NISSAN WILL SUPPLY OWNERS WITH A NEW LABEL AND INSTRUCTIONS ON HOW INSTALL THE LABEL OR THE OWNER WILL HAVE THE OPTION OF TAKING THEIR VEHICLE TO A NISSAN DEALER TO HAVE THE NEW LABEL INSTALLED FREE OF CHARGE. THE SAFETY RECALL IS EXPECTED TO BEGIN ON OR ABOUT MAY 14, 2012. OWNERS MAY CONTACT NISSAN AT 1-615-725-1000.